Jhon Clyd Talili is the announced grand winner of Tawag Ng Tanghalan Kids on It’s Showtime on Saturday, June 10, 2017. 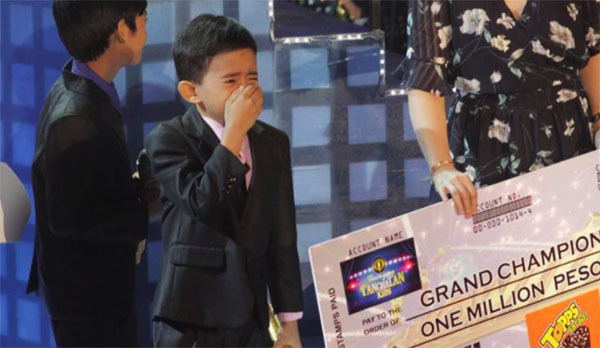 Jhon Clyd Talili from Mindanao becomes the first ever grand champion of Tawag Ng Tanghalan Kids Edition on Saturday. Jhon Clyd beats four other contenders including Mackie Empuerto, Francis Concepcion, Sheenna Belarmino and Kiefer Sanchez in the public vote. For his grand final performance, Talili performs his version of ‘I Don’t Want To Miss A Thing’ by Regine Velasquez. Voting results shows Talili collected a total of 89.90% of combined votes from the viewers and judges. Jhon Clyd Talili received house and lot, musical instrument package, vacation package, business package, a recording contract and one million cash prize. What do you think of the Results? Share your thoughts and opinion on the discussion box below.